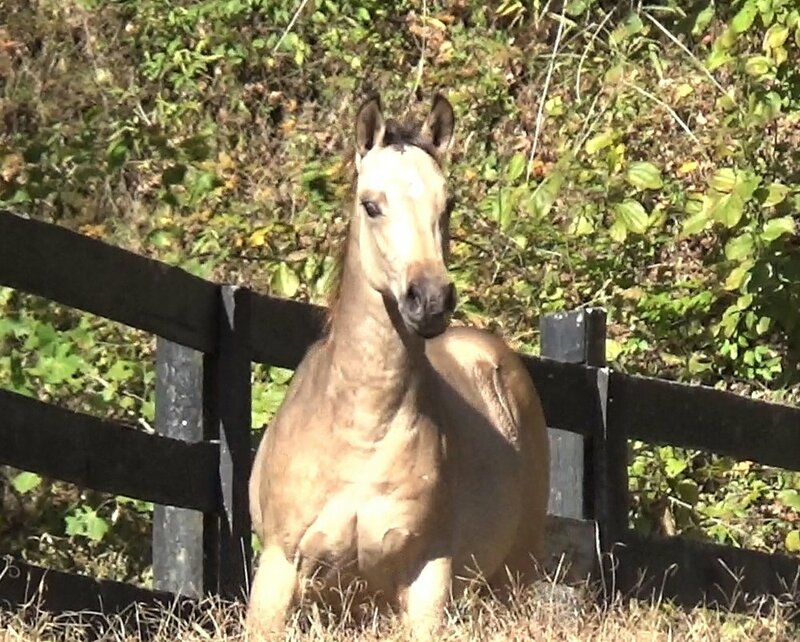 Steel A Queen is a a beautiful Buttermilk Buckskin Filly. She is sired by White Steel and out of Rocka Bye Queen. She is one well bred little lady lines to Poco Bueno, Doc Bar, Colonel Freckles and Little Steel Dust. A solid foundation pedigree that will enable her to shine in performance. This filly has the most beautiful eyes. Like liquid pools of light. She has a beautiful head, a wide, well musceled body with a deep hip and a well defined chest. She is a nice mover and shows tons of athletic ability. This girl has all the makings of a good using horse and is bred to be one, too. Queen has a great temperament and is easy to handle. She has been bathed and clipped, leads and ties and loads and backs out of the trailer. She has been over our obstacles and is not spooky or nervous at all. She has that mellow disposition that Foundation Quarter Horses are known for. Queen is now weaned and is growing up on the rolling Kentucky hills to develop good feet, strong tendons and will have a healthy social structure. Like all lucky horses should have. Both her sire and dam have quiet and trainable dispositions. We feel that is an often overlooked asset in a breeding horse. Disposition is inherited and effects train-ability. Poco bred foals have a quiet personality and are confident with a good, trainable mind. This pretty girl will go on to be a top notch performance horse. She already has a head start on her training and is better mannered than many older horses. She will be easy to start under saddle when the time comes as she has been given such a strong foundation of trust and leadership.